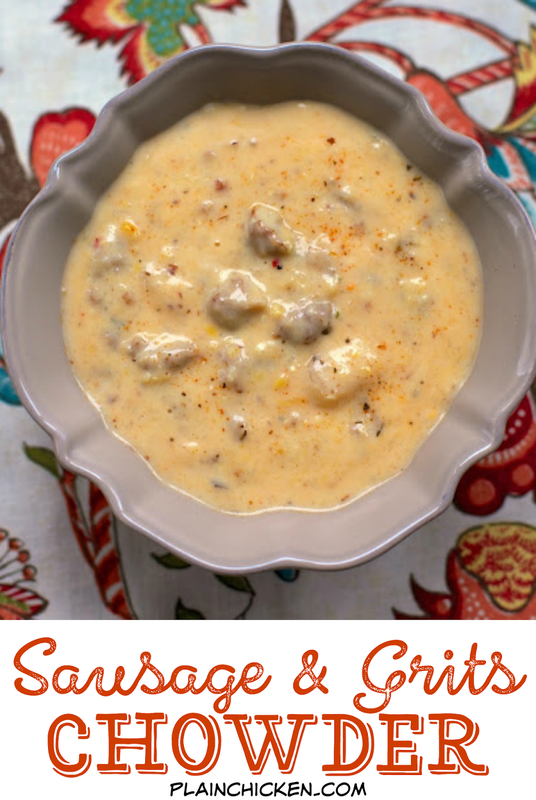 Sausage and Grits Chowder - sausage, potato soup, creamed corn, milk, cajun seasoning, grits and water. Ready in about 15 minutes! SO delicious! A few months ago, I had lunch at a new place in town. I got the soup and sandwich. The soup was full of sausage, corn and grits. It was delicious. I had never had a soup with grits in it. I knew I had to try and recreate it at home. Flash forward a few weeks. 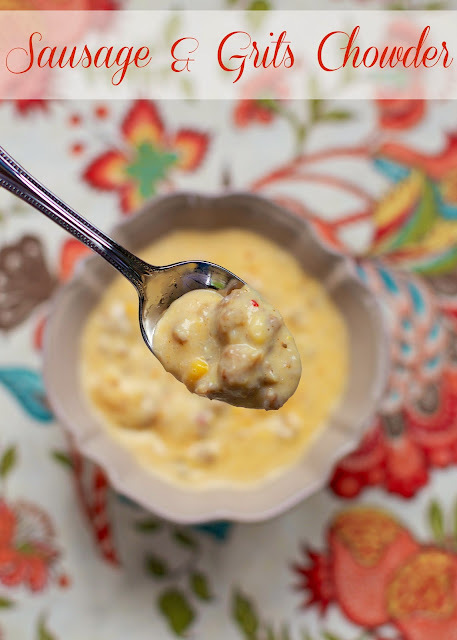 I received an email from a Plain Chicken reader, Kerri, for a soup that her family loved. It sounded like I could tweak it to make it similar to the soup I had at lunch. I added some cajun seasoning and cooked grits to the soup and it was delicious! Chicken Legs raved about this dish. We reheated it for lunch, and it was equally delicious. You might need to add some milk when you are reheating it, the grits really thicken everything up when cooled. In a small saucepan, bring 1-1/2 cups of water to a boil. Stir in 1/2 cup of quick grits. Cover and reduce heat to low. Cook for 5 minutes, until grits are done, stirring often. Brown sausage over medium-high heat in a 4- to 5-quart Dutch oven. 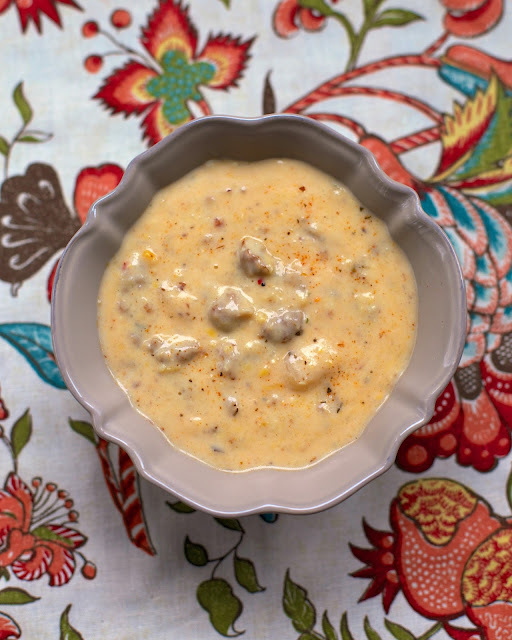 Stir in Cream of Potato soup, cream corn, 2-1/2 cups milk and cajun seasoning. Stir in cooked grits. If soup is too thick, add more milk. Simmer over low heat until heated through, approximately 10 minutes. I've never had grits, I can't believe it! I have to make this soup, it looks soo good! I'm not a huge plain grits fan, but they are wonderful in this soup. Can you replace the cream of potato with anything else or just more milk? My son can't have gluten and most cream of whatever soups contain gluten. You can try leaving it out. You could add fresh potatoes instead. I would wait and see the consistency before adding the milk. I checked Pinterest before Feedly this morning...and saw Heather's pin of this...and nearly fell out of my chair just from picture and title. This sounds and looks SOOOOO good! Thanks! It is really, really good! I've never heard of this soup but it sounds amazing ~ I don't say this often but I'm going to make that is weekend! Was it a restaurant here in Alabama? Dixie Fish Company on 280 in Birmingham. This looks terrific! I could use a big bowl during our blizzard tomorrow! What kind of sausage did you use in this recipe? I always use Tennessee Pride sausage. As a southern girl I am always looking for new ways to use grits... This looks yummy! An excuse to have grits and sausage for dinner? The family is going to love this one! I would never have thought to add grits to a soup but it seems like a good way to thicken it, especially for a grits fan. Sounds and looks delicious and starting with canned soup makes it too easy not to try. I will have to see if I can find "grits" here in the north and try it your way. For the person who was wondering about sausage, I use Italian pork sausage from the fresh meat case. I think whatever you have will work fine. Thanks so much for sharing your recipe!! Look for Quaker Quick Cook Grits - it is near the syrup here.